Today I am doing a feta cheese review. I absolutely love this feta cheese, and I never have a salad without some. 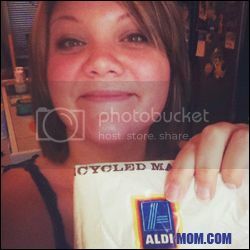 I found it sitting in Aldi one day and decided to give it a try on my salads...I was very happy that I did. It's moist, and has a strong, testy flavor. Last time I was at Aldi they even had two new versions: Mediterranean and Tomato Basil. We tried the Med and loved it as well. I still prefer the original. The only thing that would bump this up to better than the rest is if the container had more in it. I can only get about 3 salads from one container, but National Brand containers are also small so if my only complaint is that I want more, I guess that's not a complaint. Hehe. I simply add the Feta to my normal salad: Chopped romaine, tomato, cucumber, bacon bits. Sometimes I add a boiled egg, with light ranch. Or, you can add it to the sweeter salads like Romaine, mandarin oranges, almonds, and raisins. 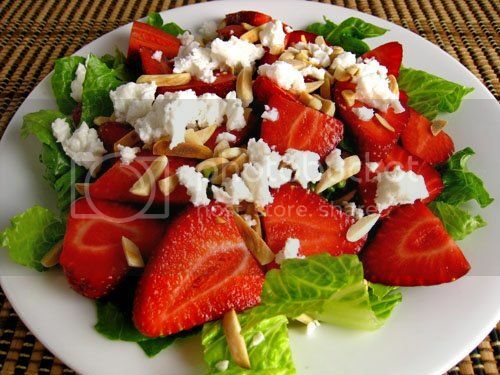 Or, try this new salad idea...Romaine, strawberries, and almonds! When I make salads with sweeter ingredients, such as fruit, I always use one of my sweet salad dressings: Raspberry poppy-seed, or Sweet Italian. Sweet salad dressings don't taste as good with other cheeses, in my opinion! What is your favorite way to make a salad?